Hyderabad: Commercial operations of Hyderabad Metro Rail’s first phase will start on June 2, on the occasion of Telangana Formation Day. 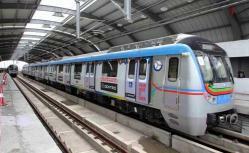 The state government is trying its best to get Prime Minister Narendra Modi to inaugurate the Metro Rail on the day. Minister for municipal administration and urban development K.T. Rama Rao said on Thursday that all the required works, including tests and trials and certifications for the Metro, would be completed by then. The first phase includes Stage-1 from Nagole to Secunderabad railway station (about 9 km) under Corridor-III and stage-2 from Miyapur to SR Nagar (11.9 km) under Corridor-I. A total of 20 km will be opened up for commercial operations on June 2. In fact, the Nagole-Mettuguda stretch (8 km) was complete and was meant to commence operations on Ugadi 2015 but was put on hold as there would have been revenue losses. The state government and L&T then decided to extend the stretch up to the Secunderabad railway station. Currently, works between Mettuguda and Secunderabad are on. The Miyapur and SR Nagar stretch, including the Bharatnagar Rail overbridge, was completed in 2015 and trial runs were held last October. During a test run in December 2015, Mr Rama Rao had announced that these stretches would be opened in early 2016. The stretches that will be operational from June 2 have been ready for months but were delayed owing to several reasons. At present, 72 km of Metro lines are being constructed in three different corridors in the twin cities.